In the current vintage-automobile market, the hottest American classic trucks today come from the “Big Three” Chrysler, Ford, and GM. 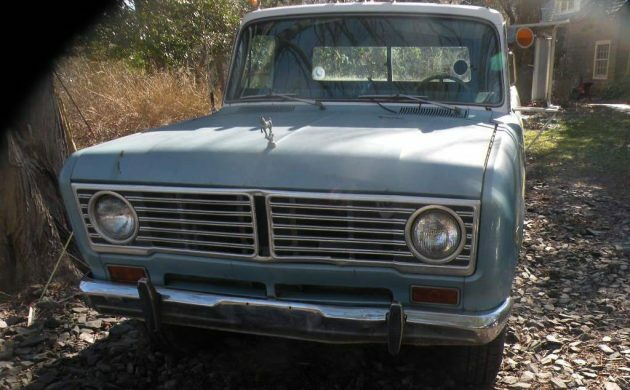 Not many people remember that International Harvester made some pretty capable pickup trucks like this 1972 1210, which is for sale here on craigslist in Philadelphia, Pennsylvania and asking $5,000. Technically called the “D-Series”, the 1210 was part of IH’s “Light Line” of trucks and SUVs at the time, spanning the years 1969 through 1975. Buyers had the choice of seven different engines and five different transmissions during that time, ranging from 231 to 401 cubic inches and 3, 4. or 5-speed gearboxes. It’s worth remembering that today’s Navistar heavy-duty vehicles can trace their heritage back to trucks like this, and even further back to the 1830s with Cyrus McCormick‘s revolutionary grain-harvesting machine. 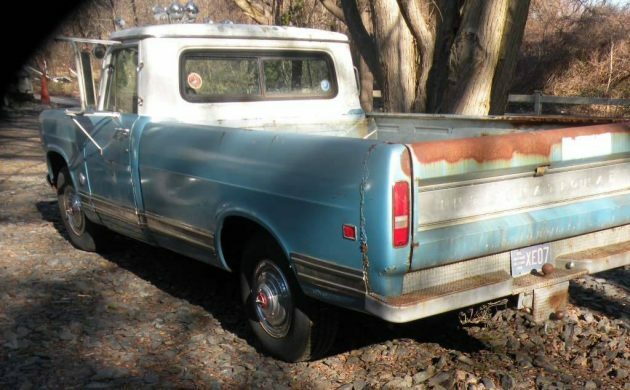 The seller of this one doesn’t give us much to work with in their description, but we can see that there is a V8 engine and automatic transmission, power steering and brakes, and a heavy-duty rear bumper. We are told that it runs and drives after a new battery and carburetor were installed, but it doesn’t stop very well. The pictures confirm that there is indeed some rust, as well as a seat that has seen better days. 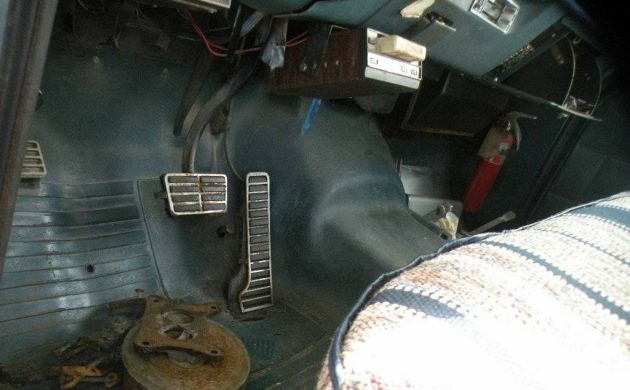 We also see something that looks like a trailer-brake-controller and an aftermarket 8-Track player. I did not know much about IH trucks before writing this article. I only ever knew about Scouts, because my late Great-Grandfather had a 1980 Scout II in beige with the olive-green interior. I really wanted that truck, even more than his pristine 1966 Oldsmobile that only came out of the garage on nice days, but when he passed, one of my other relatives got them both in the estate. But enough about that: For this truck, even though it would be a bit of work, would you want it? Very cool truck. I’d get the brakes in good working order, have the seat professionally recovered and drive it as often as possible. Non structural rust has never bothered me. The 8 track player is a plus. Anyone have a copy of Black Sabbath’s ‘Sabotage’ on 8 track? How about M U The Best of Jethro Tull? Iron Butterfly’s, In La Gadda Da Vida. The long version. “Inna Gadda Davida”. They were trying to sing “In the Garden of Eden” while flattened on reds. True story! I never had a radio in mine, and probably couldn’t have heard it if I had one. 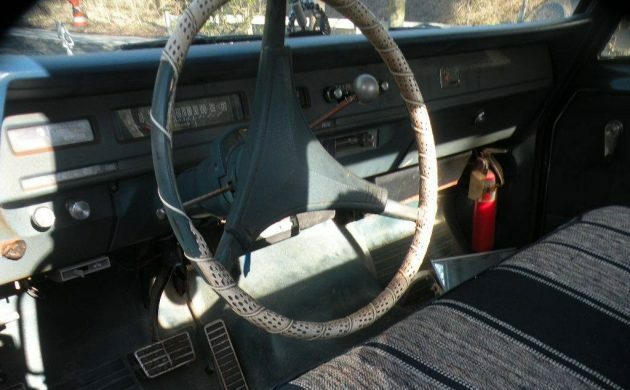 Had the windows open most of the time just to stay cool in the cab – Nashville in summertime. Good thing about plastic upholstery is that getting caught in a Tennessee frog-strangler wasn’t gonna hurt anything. or Nazareth hair of the dog. now your messin with. . . It pains me some to hear someone may not have ever heard of the greatest pickup trucks made. Makes me feel old, “like what’s a Packard”? ( or insert any defunct car maker) These were my least favorite of all IH pickups, but shouldn’t deter anyone from buying one. I have personal gripes with the IH V8, but stout units, none better. IH hadn’t had a good sales since the 60’s, and the decline in farms, IH pickup trucks biggest buyers, probably helped with the pickups demise in 1975, for IH to concentrate on the bigger truck market, that was going great guns at the time. 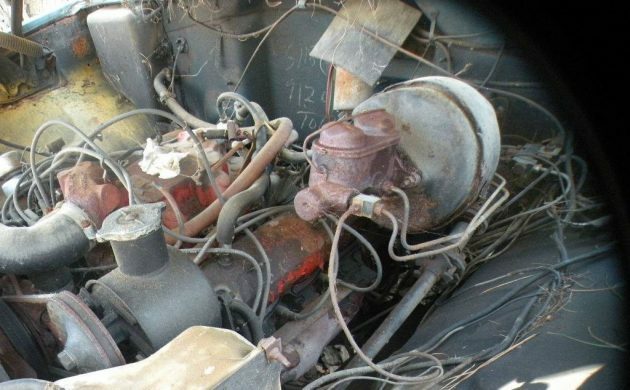 This appears to the IH motor,( hard to tell which one by looking at it) but it should be noted, IH used AMC motors toward the end, because of a shortage of IH motors. The 401 was AMC’s substitute for the 392, which was in high demand for school buses at the time. The thermostat housing, I believe, is the giveaway. 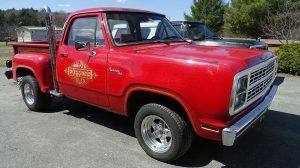 Great find of a rare truck to begin with. In Fall of 1963, I flew down MATS to McCord with another Airman who’d just bought a new Travelall from the Carrington Company in Anchorage, and saved a thousand or so by taking delivery in Seattle. That was my first and best Alcan trip, mostly because we shared the driving, and I got to drive the best set of consecutive curves on the Highway while Wright was fast asleep. Graded gravel was as good as it got then. The next section? “Paved” with boulders! Great truck – 2WD with the big six. Pulled like a mule team, but a lot faster and quieter. According to the official literature in the glovebox, the engine was made at the Briggs & Stratton plant in Wisconsin. Had a couple Travellalls with the 345. Both had that tall t-stat housing. Tough old beasts, but had to find parts in the pre internet days. Hey Kenneth, a lot of cool movies have been shot in and around Inverness! I remember IH mostly for the tractors on my uncle’s yards but their pickups were very common too, where I lived on the Canadian prairies. Although they had a pretty good reputation for reliability, you gotta admit their body designers probably spent more time looking at tractors than cars. Or else they just got their 8 yr olds to design those grilles with a crayon. I had an 1110 from the same year – 232 AMC Six, two-speed automatic, cart-sprung front axle. After I’d put a set of cheap takeoff street radials from the 4-for-$120 place it gained a better sense of direction and was actually pleasant to drive, though its heaviest cargo was a small load of sheetrock, and (before the radials) a rick of firewood, which was NOT pleasant. IHC was morphing into Navistar around that time, and the local dealer had less than no interest in letting it into his shop, so when it took to chronic overheating after a few miles I wound up selling it for $100 cash to a guy needing it for Christmas-tree deliveries. What I liked most about it was its school-bus-yellow color, roughly the same as some municipal trucks, which made it all but invisible to both local and state traffic cops. gun shots, just pure peace and quiet. supplies for my tiny house which starts going up next month.